Plastic-free has just become an option at a Dutch supermarket. At the Ekoplaza store in Amsterdam, grocery shoppers can get their yogurt or rice or chocolate (and 697 other items) in an aisle with glass, metal, cardboard and compostable packaging. Even items that look like they have plastic wrap are in a substance that breaks down in your home composter within 12 weeks. Ekoplaza says that all of its 74 stores will have the aisle by the end of this year. 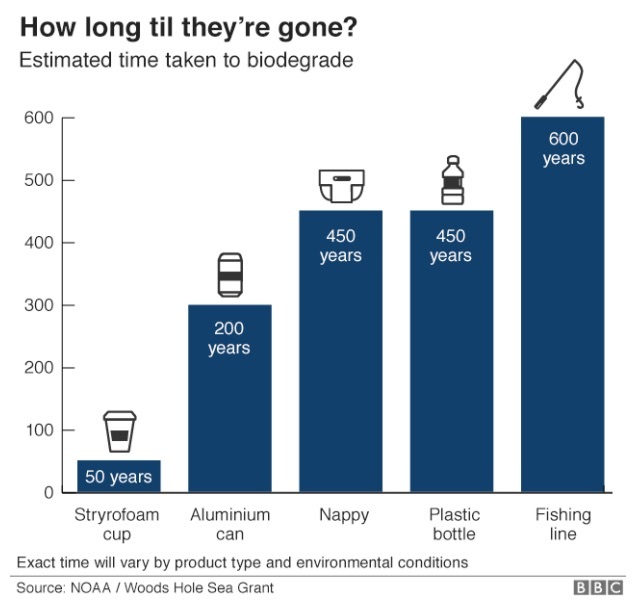 In a December 2017 article, the BBC News created the perfect summary of the plastic problem in a series of charts. The four that follow provide the big picture. 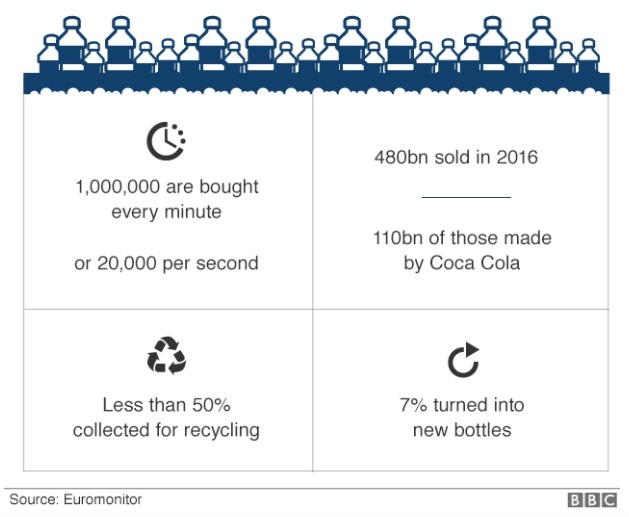 How much waste from plastic bottles? It’s a lot. But incentives do make a difference. In a 2015 article, The Atlantic compared California’s 65% to 70% recycling rate to Texas’s 5%. The probable reason? California has a bottle deposit while Texas does not. 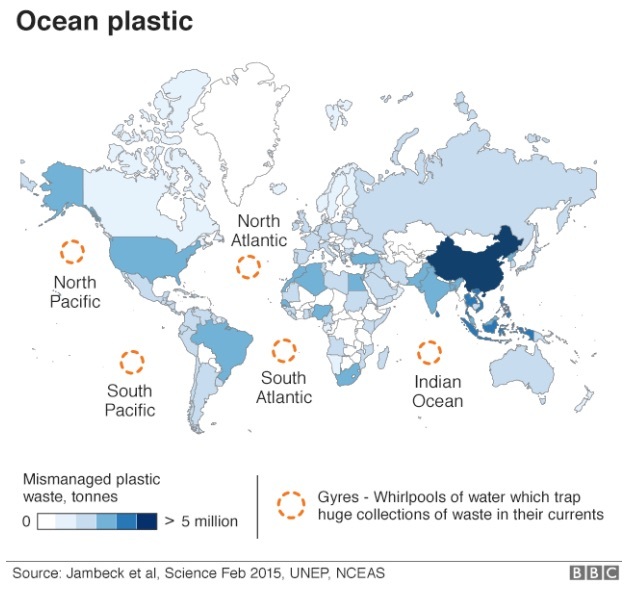 It’s tough to miss the dark blue splotch of China (in the following map) as a mammoth source of plastic waste. However, the U.S. is not only in the top 20 but, per person, tops China. Perhaps, though, Henderson Island is the perfect example of why plastic waste is a big worry. To get to Henderson Island, one reporter had to fly to Tasmania, next to Tahiti, and then to the Gambier Islands (on a once-a week-plane) where she boarded a freight ship that made a special stop at Henderson Island. The island is uninhabited. Even so, it has tons of plastic along its beaches. Yes, but with 50 years at the low end, we are looking at a pretty long time. We have plastic bag taxes, a single use cup tax, and a plastic-free supermarket aisle. Add to that bottle deposits and you have perfect examples of thinking at the margin. As economists explain, we rarely do all or nothing. Instead we think at the margin. Our decisions involve a little more or a little less. We tend to snooze for 10 minutes after the alarm awakens us or go 70 mph in a 65 mile zone. And perhaps, we will decide to do some of our grocery shopping in plastic-free aisles. My sources and more: Thanks to the Washington Post for alerting me to the no-plastics aisle. From there, moving across the channel, I discovered the BBC’s charts that you might enjoy seeing firsthand for more detail. And after that, if you want more, The Atlantic was ideal for the Henderson Island story and Wallpaper for the graphics. Finally and crucially, echoing Tim Harford’s BBC program “More or Less,” I wonder if the numbers I’ve cited are accurate. 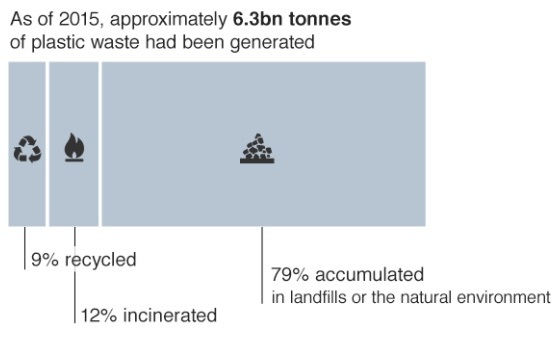 After all, the amount of plastic waste is not really quantifiable. So, please, do view all with some skepticism. But we can be confident that whatever the plastic totals, they are whoppers!